Welcome to Autumn Ridge Gypsy Vanner Horses. We are founding lifetime members of the Gypsy Vanner Horse Society and have been breeding Gypsy Vanner Horses since 2003. 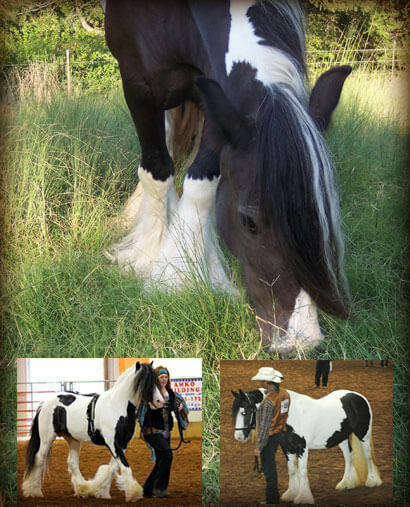 Visit our Gypsy Vanner Horses For Sale page and our Gypsy Vanner Horses Sold page. We are a small breeding operation in north-central Arkansas with proven champion bloodlines, including our champion Gypsy Vanner Mare Oakfield Dinah. Oakfield Miss Minnie (a Tom Price mare) was our first Gypsy Vanner import in 2003. Our Gypsy Vanner breeding stock lineage includes some very well-known Gypsy Horses: The Original Kent Horse, The Road Sweeper (UK), The Old Horse of Wales, The Midget Mare, Miss Price (another Tom Price mare), Tid and Fleetwood.